Above: Chefs working in the galley. In addition to the remarks made by the chef, the ship’s Head Wine Steward spoke about the wines that were to accompany the various courses. These had been selected by Norwegian’s Master Sommelier Andrea Robinson and included a sauvignon blanc from New Zealand, a California chardonnay and a cabernet sauvignon also from California. The nine course meal began with an amuse boche to stimulate the palette. A large pearl of mango provided sweetness while a salsa provided a contrasting sharpness. Next came Ahi Tuna Tartare. The fish was glazed with orange juice and wasabi and sat upon a sesame crisp. Several of the guests only toyed with this course, skeptical of eating raw fish. The meal hit its stride with the asparagus cream soup. The large, shallow bowl arrived at the table with only a cauliflower flan lying in the center. However, the servers quickly arrived and poured the soup around the flan. This allowed both flan and soup to maintain their integrity instead of merging together into a soggy mass. The result was both creamy and spicy - - a nice balance. Another dish that found flavor with the guests was the goat cheese tart. Served in a pastry shell, the warm, soft goat cheese had a strong flavor but this was balanced by sweetness and acidity from the sun-dried tomato chutney. To cleanse the palette, the next course was a granite. Its crushed ice had sweetness from Moscato wine contrasting with tartness from grapefruit juice. A few spoonfuls were all that was needed to refresh the tongue and position you for the courses to come. The fish course was next - - pan seared sea bass. Chef Andreas explained that despite its name, this dish is not cooked entirely by frying. Instead, after the dish is seared in a pan - - necessary to give color to the plantain crust - - the dish is placed in an oven in order to keep the fish moist while cooking. The plantain crust provided sweetness and a salsa once again provided sharpness. A lobster sauce yielded yet another contrasting flavor. This was a large portion; seemingly, equal in size to the main course in many restaurants. Although the flavor of the dish was well-received, some of the guests found the portion too large for such a multi-course meal. The main course listed on the menu was a veal chop. However, those guests who do not eat veal were allowed to substitute a filet mignon. The meat was very tender and tasty by itself. But what really made the dish was the truffle sauce, which had a sweetness that contrasted with the meat’s inherent saltiness. For dessert, women were given a “Chocolate Log” and men received a “Dome”. Couples were encouraged to share. I was somewhat skeptical of the dome as it is not the type of dessert that usually appeals to me. However, the yogurt mousse was so creamy and balanced so well the lychee raspberry crème center that soon nothing was left. After the final course, Chef Andreas introduced the crew members who had worked on the dinner. These included the servers who had so attentively and promptly presented each course as well as the four chefs who had prepared the meal under the Executive Chef’s supervision. They were greeted by a hearty round of applause. We were also informed that we would be receiving an invitation to visit the galley on the morning of the next sea day. Since this visit would take place between meals, the tour could be done more leisurely and less disruptively than a visit done that evening while dinner was being prepared. As promised, on the day, Chef Andreas led the group on an extensive tour of the main galley and some of the specialty restaurant galleys describing how the kitchen operated in some detail. The group then adjourned to Gatsby’s for after dinner drinks and coffee. By now the conversation was flowing amongst the guests and friendships were forming. All agreed that it had been a delicious and worthwhile experience. There is a $75 per person cover charge for the Chef’s Table. 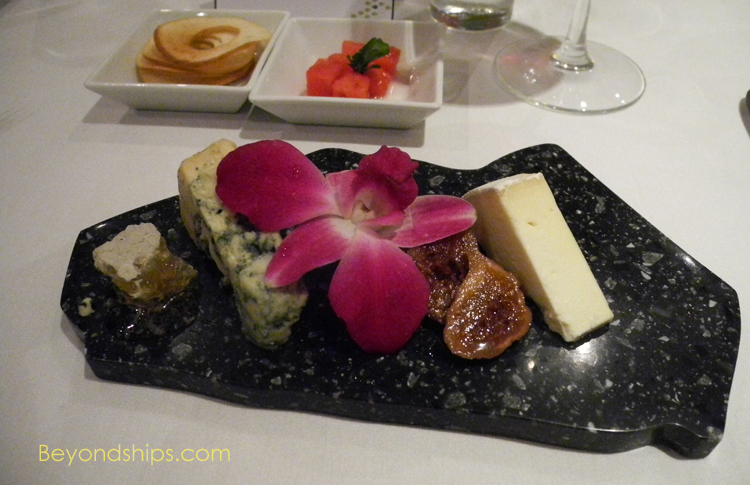 Click here for a review of four specialty restaurants on Norwegian Star.